The incurable eye disease can be initiated by a number of different causes such as autoimmune diseases (like rheumatoid arthritis, Lupus, or Stevens-Johnson syndrome), chemical burns, or even some surgical procedures (like LASIK and cataract procedures). The patient’s cornea melts due to the uncontrolled production of certain zinc-dependent enzymes called matrix metalloproteinases (MMPs) by the patient’s immune cells in the cornea. To help prevent this, the researchers developed a new hydrogel that deactivates those enzymes by removing the zinc ions. 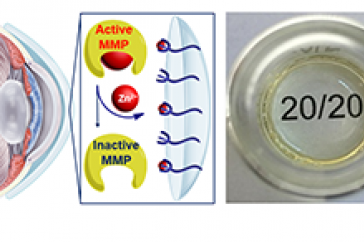 In their study, recently published in the journal ACS Biomaterials Science & Engineering, the UNH researchers, along with researcher Jung-Jae Lee from the University of Colorado Denver Campus, outline how the hydrogel deactivates MMP-1, MMP-2 and MMP-9 which are the major factors in corneal melting. The research was done in vitro and ex vivo (on extracted cornea tissue) and suggests that the new hydrogel could be a viable therapeutic option for treating corneal melting. The end goal is to make the hydrogel into a contact lens that would allow more localized treatment of the eye and avoid side effects in the rest of the body. There is a pending patent which has been filed by UNHInnovation, which advocates for, manages, and promotes UNH’s intellectual property.